Welcome to Blue Max Militaria. We are pleased to offer you the best value for your military collectable needs. We provide what we believe to be the best in military books, Zippo lighters. A BREF HISTORY OF THE POUR LE MERITE ( THE BLUE MAX). In the small German state of Brandenburg, the Ordre de la Generosite ( Order of Generosity, French was the official language of the Prussian court at the time) was established by Friedrich Wilhem I, the electotal prince, on May 12, 1667. 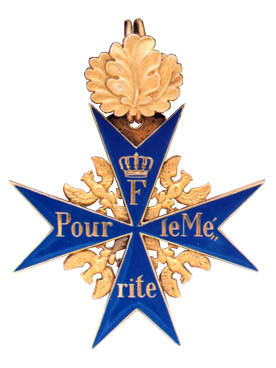 On June 6,1740, The Ordre de la Generosite was renamed the Pour Le Merite ( For Merit) by Friedrich II, who was also known as Friedrich the Great. The new order was to serve as a reward to loyal subjects for meritorious service in the pending war over the territories of Silesia. It is with the Great War (World War I) that the Pour Le Merite gained it`s fame. The creation of aerial combat brought forth a new breed of warrior that seemed glamorous and daring.Their exploits were watched by thousands of soldiers down below in the trenches. In order for a pilot to be considered for the Pour Le Merite, he would have to obtain a certain amount of aerial victories. The first pilot to receive the award had to have 8 aerial victories. On January 12,1916 Max Immelmann was the first to receive the Pour Le Merite. After that it became unofficialy known as THE BLUE MAX. By January 1917 the requirements had been raised to sixteen victories. The ony pilot to receive his award under these conditions was Manfred Freiherr Von Richthofen ( The Red Baron). The oakleaves were orginally established for the Red Eagle Order as an addition level to the Order. The same was true of the Pour Le Merite on March 10,1813. This special higher level was to be awared for extraordinary achievements. No one in the air service received Oakleaves even though Manfred Von Richthofen was considered for the award. It was to General Ludendorff`s surprise that he did not receive the award.